When you first arrive into the park, there is a small welcome center with a gift store. This provides a perfect chance to hop out of the car and stretch your legs and hit the bathroom. This park is huge, and it is still at least 30 miles to anything, so don't miss this opportunity! About 30 miles from the entrance to the park is the Panther Junction Center. This is a great place to become a little familiar with the park. There is a large 3D topical map of the park to get a feel of the place. There is also a short 20 minute video that is well worth the time to see! If you have a young child, here is a great place to pick up the Junior Ranger books! 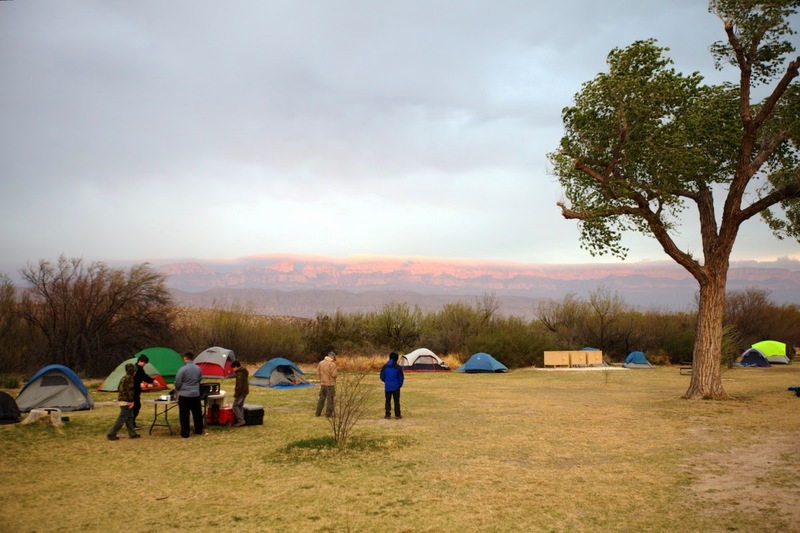 Our first night was spent with our scout troop in the Rio Grande Campground, around 40 miles east of Panther Junction. As you can't possibly see the whole park in one day, it worked well for us to start in the east and then move westward throughout the next three days. The campground is right on the Rio Grande River, and the boys really enjoyed realizing that just on the other side of the water was Mexico. 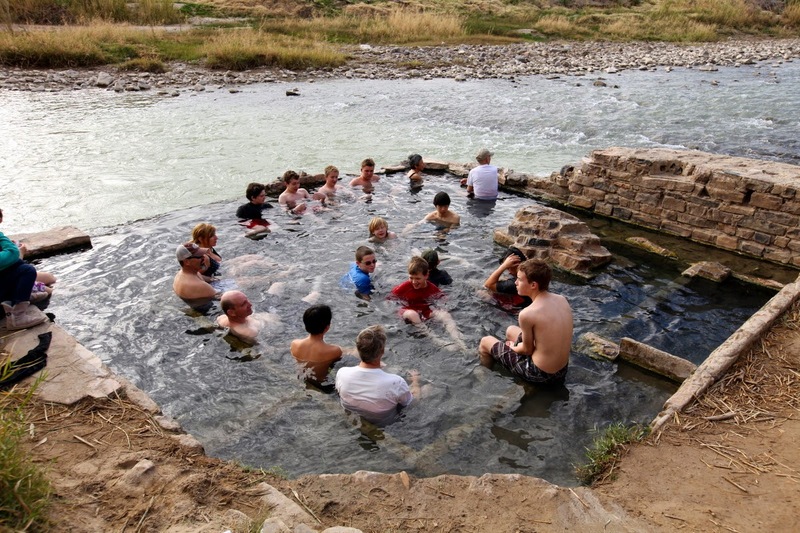 Hot Springs, in Big Bend? I know, who knew?? This place seriously has everything!! 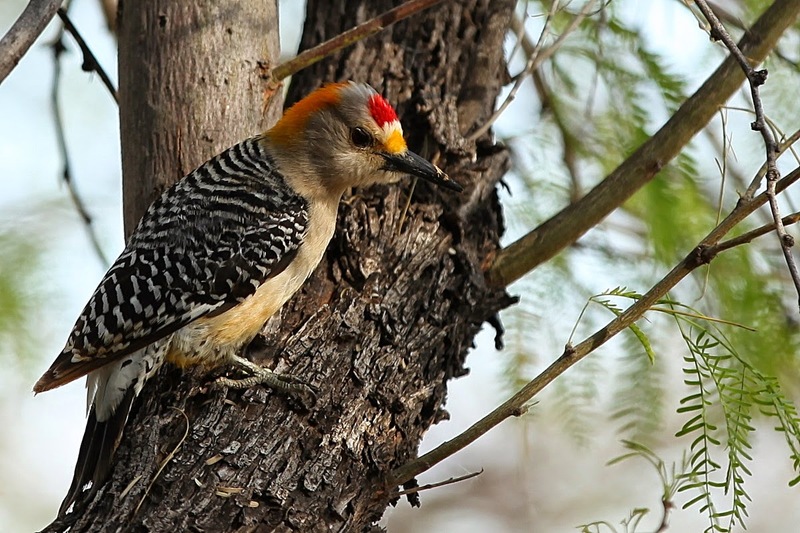 Just three minutes from the Rio Grande Campground is Hot Springs Trail and village. Either take a short 3 mile hike from the campground to the springs, or pop in the car and park at the now abandoned Hot Springs Village. Make sure to pack your bathing suit, as this spring is a constant 105 degrees! If you have time, check out the Hot Spring Village, built early in the 1900s. It was believed that the water from the springs cured ailments. Check out the Indian Petroglyphs on the cliff walls! We had an amazingly fun trip, but honestly, this might have just been the highlight of it all! 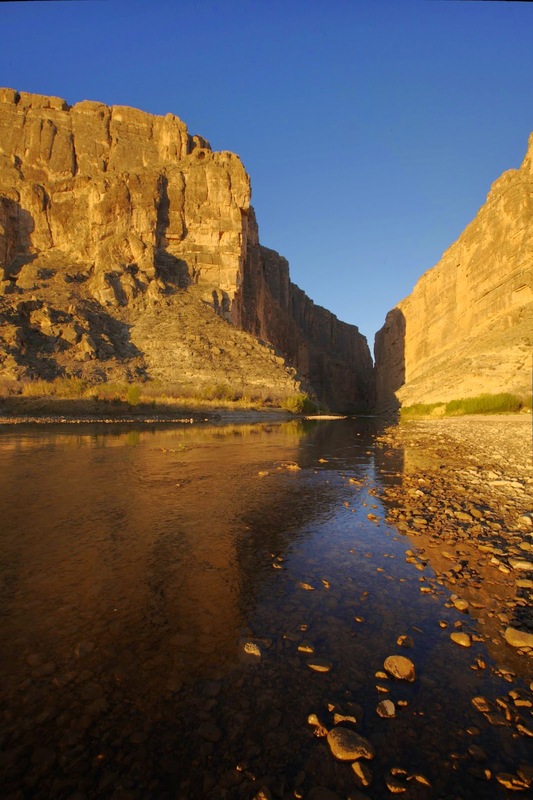 About three miles from Rio Grande Campground is Boquillos Canyon Trail. It starts at the top of the cliff with some great vantage points and then travels less than a mile down to the river. At the end is a small beach that leads into an amazingly beautiful canyon. The highlight for us, however, was the huge sand cliff to the left. To give you an idea of the size of this place, we are the tiny dots in the middle of the photo! We finally summoned up the courage to climb the sand hill - - much harder then it might initially seem, with the slipping sand. The kids (ok, all of us), then spent an hour sliding down, then climbing up again. Close to the Rio Grande Campground is a crossing into Mexico. 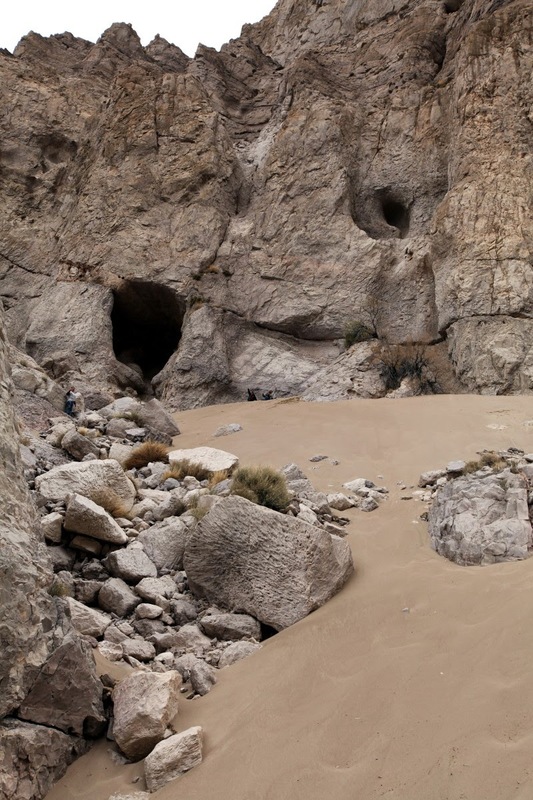 We did not make it to the Mexican Village of Boquillos, though I have heard it is worth the time. Next time we will be sure to bring our passports and check it out! If you can see looking at the photos, we had a huge variety of weather. Rio Grande Campground was extremely windy and cold. 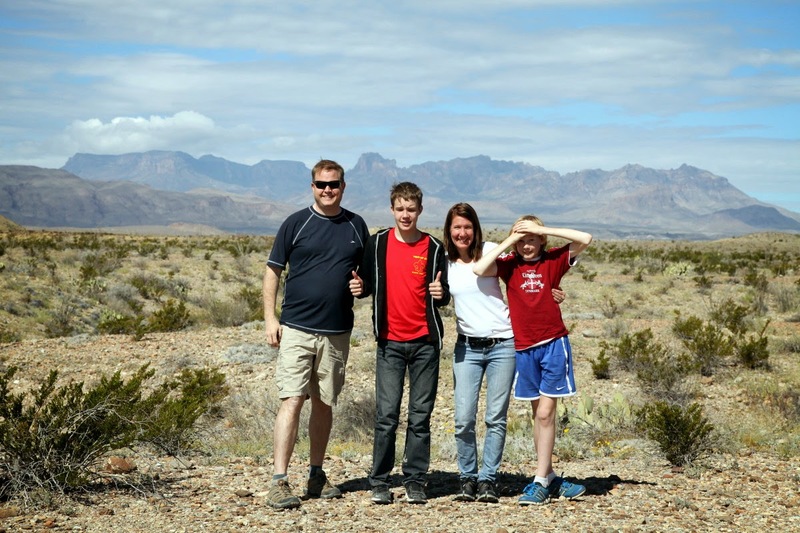 When we ventured west toward Chisos Mountain in the center of the park, it was much warmer. 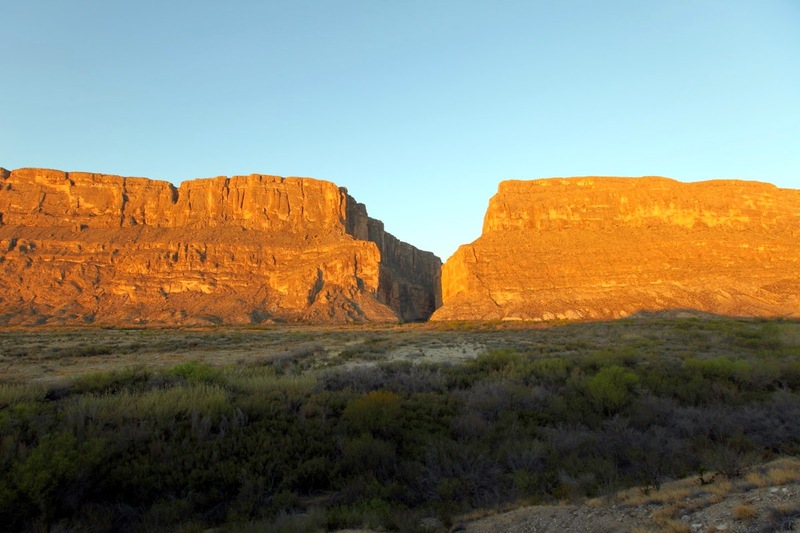 You can either spend a night or two in Rio Grande, and then pack up and head to Chisos Campground, or you can stay put at the Rio Grande and make a day trip and drive 30 miles west to visit the center of this amazing park. This 5.6 mile round trip hike was another highlight of the trip. Much different than the terrain at Rio Grande, this is high in the mountains, with an elevation of 7,000 feet. This trail begins at the Chisos Mountain Lodge, and winds around a small creek. At the end of the hike is an amazingly' beautiful overlook, framed by two cliffs! I have heard that you can take this trip to arrive at sunset - which sounds amazing!! Just make sure you bring headlamps for the return trip! We did not have time to make the South Rim Trail, but I have heard it is beautiful. The whole trail is 12 to 14.5 miles, so if you do it, you need to start at dawn and hike all day. But ideally, on a return trip, we really hope to be able to backpack the trail, spending a night out on the rim! There are also many other trails in the Chisos Mountain area, but we only had a day to spend in the area! Did I mention this place was huge??? After exploring the east and central parts of the park, we decided to head to the western "desert" area. 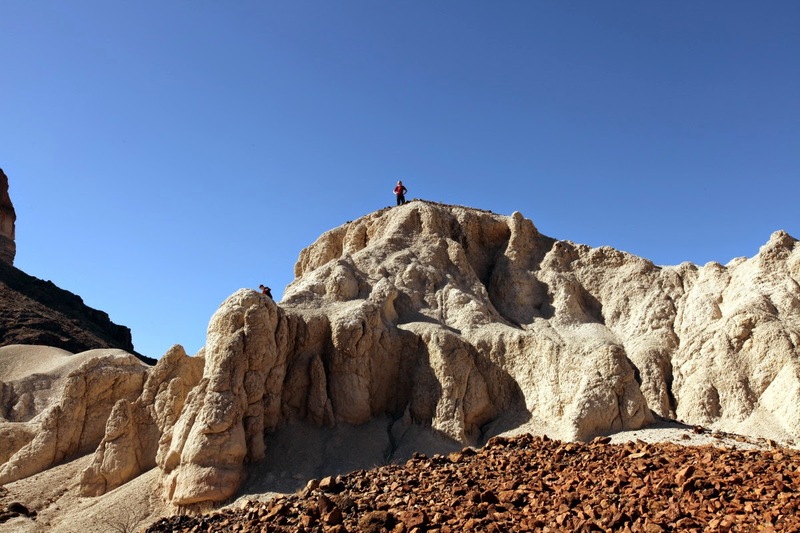 The desert area is a two hour drive from Rio Grande Campground - and that is if you don't stop - which is almost impossible since the views are irresistible! I would strongly encourage visitors to either spend a night at Chisos Basin (an hour and a half drive), or ideally get a spot at Cottonwood Canyon. We took some stops along the way to check out the amazing views. One of our stops was to examine these amazing lava formations created millions of years ago! We spent the first two nights with our scout troop. However, after this we broke off on our own to explore the western part of the park. So began our most interesting night. The campground spots fill up quickly. However, the park often will have first-come, first-serve spots available that require no reservation. We had hoped to get one of these spots in Cottonwood Canyon campground to spend the night there. Unfortunately, Spring Break is Big Bend's most highly visited time, and Cottonwood Canyon is small... all spots were taken for the entire time we were there. This led to a very tense moment, as we realized we didn't have a place to stay for the night. In talking to the park ranger in Cottonwood, he mentioned that there were still some primitive camping spots available. As I recall, Big Bend breaks the whole park into 30 areas, and each area is one primitive campsite. In order to camp there, you must carry all of your gear in a half mile from the road. There is no water or facilities available. This is definitely not for everyone... but is a treasure for those willing to put up with the circumstances. We spent the night, the only living beings for miles around... no lights, no people, just the amazing silent beauty of the earth! THIS WAS SERIOUSLY AMAZING!! One of the most memorable nights in our lives. 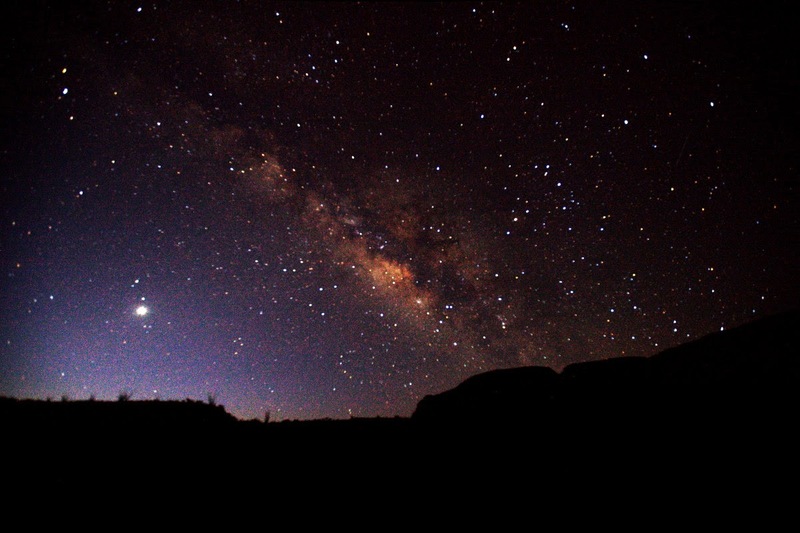 The Milky Way was so bright, we felt like we might possibly be able to read by it!! Another amazing hike. We hit this canyon both at mid-afternoon, and then again at sunrise. It is about two mile round trip hike that is fairly easy. The views of the canyon at the end are unforgettable! Our family is a family of campers, so tenting it was our favorite option. 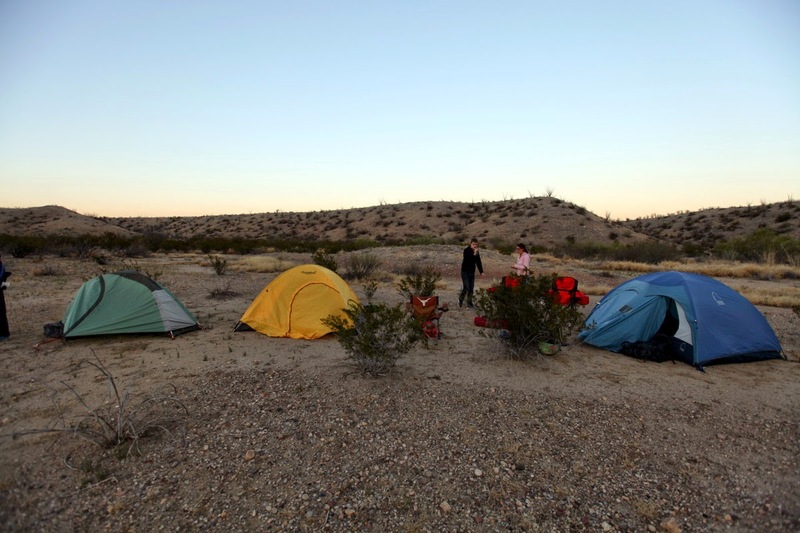 There are three campgrounds on site: Rio Grande Village, Chisos Basin and Cottonwood Canyon. They are located in the East, Central and West. But for those of you looking for a little more comfort, there is also a lodge on site. The highlight of our trip, we spent one night primitive camping. There are no amenities (read: showers, toilets, water... anything). Our night is the primitive camping was certainly the highlight of our trip. ●●● How long to stay? We spend three full days in the park and wish we had had more time. The park takes a full two hours to drive east to west. We spent a couple of days driving home, and visited McDonald Observatory and Monahan Sand Dunes. If we'd had time, we would have like to stop at Balmorrhea as well!